FEATURES. 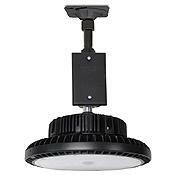 Low Bay Garage luminaire with built-in heatsink for optimal heat dissipation and long-life performance. Features frosted polycarbonate lens with glare control and standard 120° beam spread. Corrosion and weather resistant oven baked standard black polyester powder coated finish. Multiple LED wattages and color temperatures to choose from. Built according to U.S. and Canadian safety standards. IP65 Rated. Suitable for Dry or Wet Locations.